The life and work of the painter whose death in 1610 followed years on the run as a murderer. The film links the characters in Caravaggio's art with the violent events of his career. As with his earlier film, Sebastiane (co-d. Paul Humfress, 1976), Jarman is interested in how "man's character is his fate" in his meditative portrait of the Renaissance painter Michelangelo Caravaggio (1573-1610). His treatment relies less on naturalism than on an attempt to visualise the world as Caravaggio saw it. The chiaroscuro of the period is so well delivered that often the staged scenes appear at first to be Renaissance portraits. The young Caravaggio, played with impish sensuality by Dexter Fletcher , sells his work and his body and gives himself over to Bacchus: "I took on his fate, a wild orgiastic dismemberment". Patronage from a cardinal allows the artist to live well and learn how to "repeat an old truth in a new language". The film cuts between the older Caravaggio ( Nigel Terry ) on his death bed and earlier episodes of his life, knitted together with a poetic voice-over which articulates the artist's struggle with doubt and how to invest art with the passion of lived experience. It is clear that Jarman himself wrestled with these elements, and the film is most successful when he captures the tension between emotional reality and the creative representation of it. Many scenes linger on the patience art demands, showing the artist waiting for the canvas to breathe life into his subjects. The dramatic intensity of lived experience threatens to overtake Caravaggio when he meets the young brawler, Ranuccio (played with Cockney relish by Sean Bean ) and his lover, Lena (one of Tilda Swinton 's best performances for Jarman ). A messy love triangle ensues and Caravaggio is wounded rather symbolically in the side by Ranuccio in a fight. Jarman 's anachronistic elements, such as the sound of a train, a typewriter, a magazine, keep the themes eternal rather than historical, and add another texture of the lived experience Jarman brings to his artistic practice. Jarman 's love of ritual finds full expression in the elaborate enactments of Catholic ceremony upon Caravaggio's death and the final scene suggests that the artist as a young boy found his vocation upon seeing a performance of the Passion. 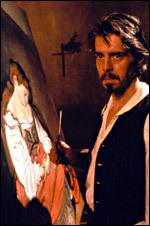 Some may find the parallel between Christ and Caravaggio heavy-handed, but the film grapples ardently with the portrayal of an artist's life in ways that must have inspired films such as Love is the Devil (1998), John Maybury 's portrait of Francis Bacon and Looking for Langston (1989), Isaac Julien 's meditation on Langston Hughes . *This film is available on BFI DVD, and is also the subject of a BFI Modern Classics book by Leo Bersani and Ulysse Dutoit.